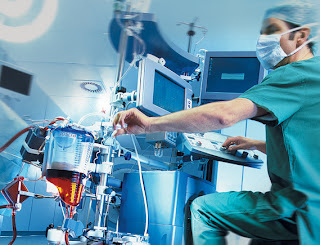 Cardiothoracic surgery focuses on treatment of the heart and lungs—the organs within the chest cavity—and includes surgery to correct heart malformations, repair pathology within the heart, and to treat lung conditions including cancer, emphysema, esophageal cancer and mediastinal diseases. Perhaps the most dramatic surgeries performed by cardiothoracic surgeons are heart, lung and combined heart-lung transplants. One of the most common cardiothoracic surgeries is the coronary artery bypass. During this procedure, which aims to bypass blockages in essential coronary arteries, a blood vessel is harvested from another location in a patient’s body and grafted around the blockage. Other frequently performed cardiothoracic procedures include repair and replacement of cardiac valves. Cardiothoracic surgery includes procedures for repairing defects of the great vessels of the heart such as repairing the aorta if it is in danger of rupturing. Connecting the carotid artery to the pulmonary artery in order to ensure proper blood flow to the lungs (usually in children with cyanotic heart defects) and closing the ductus arteriosus in children when it fails to close on its own are relatively common neonatal and pediatric procedures. Some of the unique challenges in cardiac surgery include the heart’s constant movement and presence of large quantities of blood. Surgeons have developed techniques to stop the heart during open-heart surgery and drain the blood. A cardiopulmonary bypass diverts blood to a pump-oxygenator to ensure that all organs receive sufficient oxygen during the procedure. In recent years, techniques “beating heart surgery” and minimally invasive surgery techniques have been developed that reduce or eliminate the need for cardiopulmonary bypass. Thoracic surgery addresses all organs within the chest including the bone and tissue that form the cavity. General thoracic surgeons may remove cancerous portions of a lung or the esophagus. In the latter case, the surgeon might also reconstruct that portion of the gastrointestinal tract. Some cardiothoracic surgeries may be performed using minimally invasive laparoscopic techniques. Nissen fundoplication is a procedure for treating persistent and severe gastro-intestinal reflux that has been unresponsive to non-surgical treatment. The procedure enhances the barrier between the esophagus and the stomach to eliminate—or at least reduce--backflow of stomach acid. Achalasia, a condition in which the lower esophageal sphincter is so tight that food cannot pass into the stomach, is treated by cutting the outer layers of muscle that surround the esophagus to loosen it sufficiently for food to pass through, in a procedure known as the Heller myotomy. Nice equipment, its very important having a complete medical equipment for some emergencies. Thank you for sharing your post.